Template page "Contact" is not working, We need a plugin? (2015-09-04, 21:12:55)denisnorma Wrote: Template page "Contact" is not working, We need a plugin? There are many excellent contact form plugins in GS Extend. If you do not want to use other plugins - then I could make its own form based on theme component. Again, if it's necessary to you . In theme administration page added a new editing area - Social networking settings. 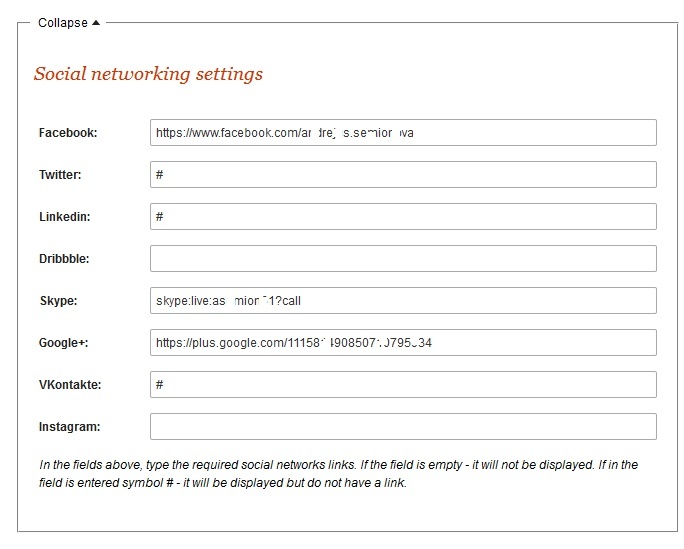 In order that the required network links to be shown in public pages you need to save it in the appropriate field. If the field is empty - that link will not be displayed. If in the field is entered symbol # - the network icon will be displayed but will have no links. 2. Installed site content search engine compatible with i18n plugin. Search results will be displayed on a separate page. If on your site is installed i18n_search plugin - it will be used in the search. Otherwise will be used an internal search engine. No problems. I found a contact.php thought this page template. As a template it is not working. About contact form GS I know. What is the purpose of the file contact.php? 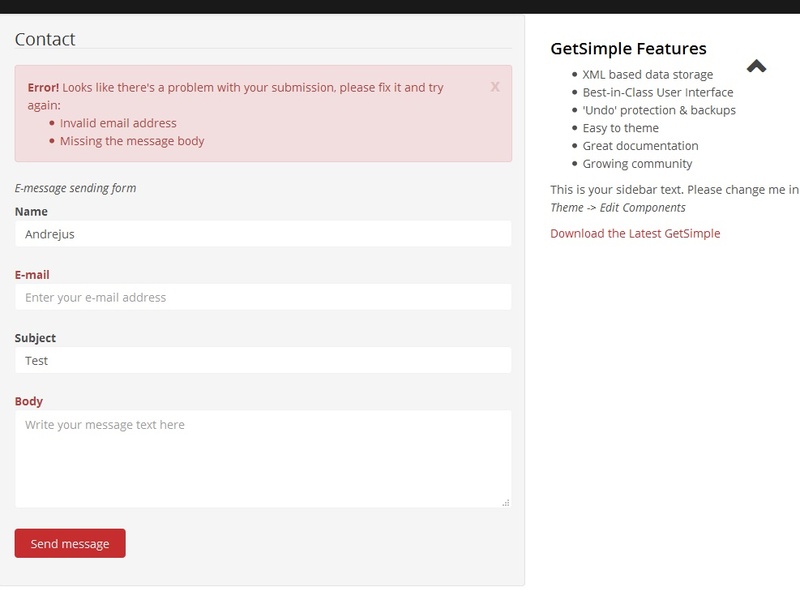 Installed e-message sending form that utilizes a theme template contact.php file. Form can be used to send standard e-mail messages. After form activation will automatically creates data files and menu items in 3 languages (English, Lithuanian and Russian). The message will be sent to the site's primary e-mail address entered in the user profile. 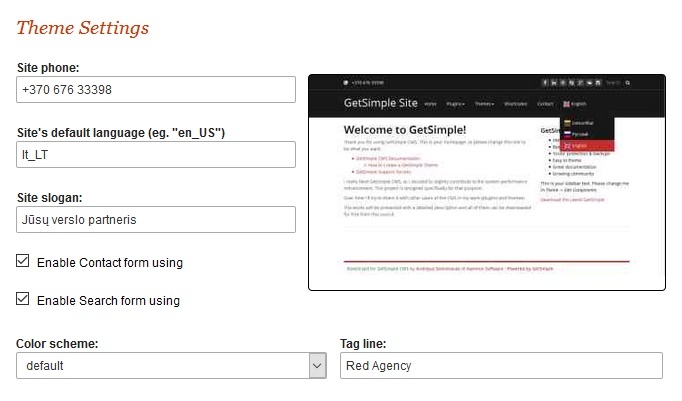 In theme administration page added a new editing area where you can enable or disable search form and contact form usage. The required data files will be generated and modified automatically. It seems that your website language is not English, Russian or Lithuanian. Therefore, can not be found the required language file. This is my fault. In this case shall be activated an English language. Nearest time I adjust the theme installation settings.php file. And now you can try to download the attached file and replace it on your own theme. Improved all components program code (In order to update the code of used components go to theme settings page, first turn it off and save the settings, and then turn it on again). 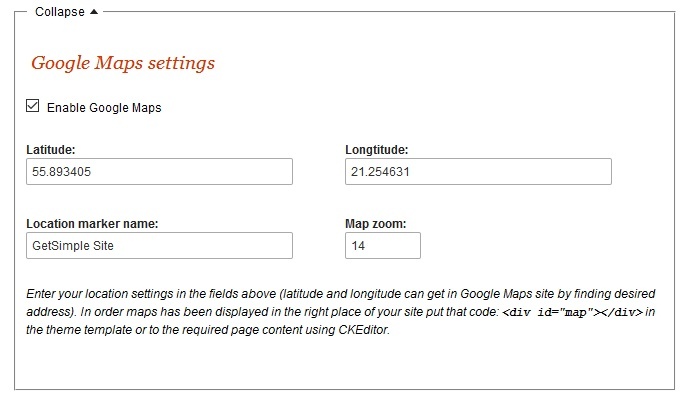 Add new settings area - "Google Maps settings". 4. The contact form now can display your location using Google Maps in special DIV element. Contact Form can use 2 templates: contact.php (without Google Maps) and contact_with_gmap.php. It seems not be possible to have a link on images used in the ra-carousel, as the a-tag ist stripped from the page-text. 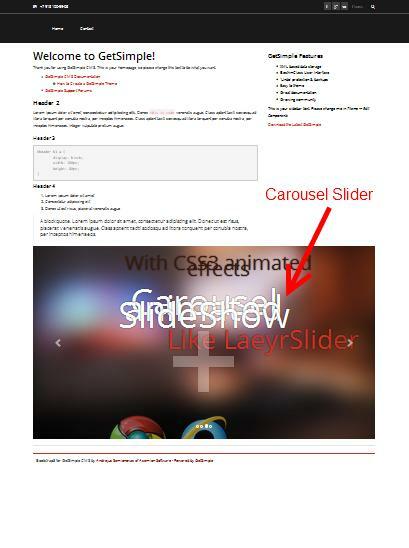 On my slideshow I'd like to link to "slide" in a clickable image or a text, which leads to another page of the site. As a quick and dirty solution I just cut out the generated slideshow-code from the source-code and made it manually in an include-file, while commenting out the line with the ra-carousel from the template. Now I could add the a-tags as I wanted. Also as for me, thanks for this theme! I just finish the job according to your request. Soon (may be tomorrow) I will share this work. Second - applied on child's slide objects (it has own reference links). Theme moved to jQuery version 1.11.3. Several slide links - applies to subsidiaries items and have own reference link (it can be created as much as you need and applied on objects like: Text or Image) see slide #2 for details. 3. In Contact form add AntiSpam check (CAPTCHA function). 4. Update Demo slides data files - it now is full responsive (all elements using Viewport measurement units) and has links to other articles. To update from earlier versions to v. 0.2.5 go to theme settings page uncheck "Carousel" component and save settings. Then re-check "Carousel" component and save settings. At the end restore Carousel slider settings. Remark: If on your slides some DIV layers obstructs the links just use CSS "z-index" property for layers priorities. You're the greatest ;-) ! Immer schön, dass Ihre Arbeit ist gefragt. 1) In the header stopped displays the name of the site. 2) the Slider on the main page is displayed at the bottom of the page (template home_with_slideshow.php). Version 0.2.4. worked correctly. But when the update appeared the problem described above. I tried to install the theme on a new installation GetSimple CMS - but the result is not changed. Thanks to St_brat for detected inaccuracies. Dear sir St_brat, please re-download theme and try again. Sometimes the internet is slow and takes a long time to load, "waiting for fonts.googleapis.com"
How you can remove external url? I have another question: In a multilanguage web how I can translate Sidebar component to different languages? Red Agency Theme use 2 external fonts from google: "Open Sans" and "Crete Round". Open css file default.less or default.css on top you can see 2 import URL lines. In your case, that the site would work faster you can download both of this fonts from Google site and place them locally on your site. Then describe them all in less or css file using command "@font-face". (2015-12-21, 04:23:33)harotz Wrote: I have another question: In a multilanguage web how I can translate Sidebar component to different languages? RA theme does not contain this component, it is common for the whole GS system. So the question is not really into this topic. 1. If your site have not many languages - then you can create Sidebar component copy for all used languages. And then use <?php get_component('sidebar_ru'); ?> for eg. Russian component version. 2. Or store all component content in Pages and create your own component which takes the contents of these pages. You can then use Theme function "get_component_with_params". with the same installation like befor i do not know why. If i install same plugins (I18N / I18N Lang etc.) slider does now available alder version of the theme i used in the past workable version but this never work why that ? What i have to do with new version instead of old that it works again? And if i add new menu in DE / EN i get black background why others i add background white. And can i replace the name in the Nav Menue (site name) with a logo too? RA theme has been sufficiently frequently tested with various GS versions, including the latest 3.3.7. With all versions it works well. All required resources are included in theme installation archive. If you want to manage all the themes settings you need to install 2 additional plugins: "theme_settings" and "less" (both plugins included in the installation). If this plugins will not be installed - theme works with default settings, but some additional features not works. This activation code are included in template file "home_with_slideshow.php". Just assign to the page that contains a slideshow this file as template. Also, make sure that the slugs specified in code meet your slides data files slugs. About site name in header - you can change them on GS settings page (field "Website name"). If you want to use logo image - this can be done with additional CSS code in file default.less (or css). When you install "theme_settings" plugin and go to the theme settings page, I think a lot of the question itself had relapsed. I really like your theme! Thanks for all the effort you put in it. I suspect this is because of jquery. As soon as I disable jquery on the theme settings page, the nanoslider plugin works fine. But then the menu does not work on mobile devices. Unfortunately, the project is currently hosted on my local server and thus not publicly availabe. Do you have any idea, how to fix this? As far as I can tell, your theme does not include header and footer hooks. Does this cause the error? The problem is that the RA theme uses Bootstrap v. 3.0. In order to use this version of Bootstrap possibilities on the site must be activated jQuery version minimum 1.9.1 or higher. Both of them use old versions of JQuery. These are both do not meet the requirements of the Bootstrap. And both of them loads JS scripts in the Header. RA theme use JS loading in Footer - for faster page loading. So, remake RA theme structure does not make sense. Because, in my opinion, JS loading most efficient exactly in Footer. I think that the problem is the in the same plugin - it's used to old JQuery. Mobile menu not work, because JQuery versions below 1.9.1 use function: getPreventDefault() that's are deprecated. If you in browser turn on JS Console - you can see this errors and warnings messages. You can change Nanoslider JQuery version with newest (for example with 1.11.3). And check the functioning of the plugin. Then uncheck JQuery loading from RA theme. And test it. If not and errors will be held from the sides of the plugin - then an assistance should go by plugin developers.